House Doctors offers professional handyman services to Colorado Springs, Monument, Palmer Lake, Black Forest, Manitou Springs, Security and Widefield. We’re building relationship and, in turn, growing the business. We’re looking forward to doing more of that in 2018 and beyond. 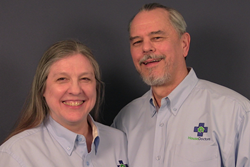 Al Cazares and Su Crocker are pleased to celebrate the one year anniversary of their professional handyman business, House Doctors of Colorado Springs. House Doctors offers professional handyman services focused on professionalism, service excellence and quality workmanship. Their goal is to make home improvements easier for their customers by being on time, doing the job right and offering a one year workmanship guarantee. House Doctors of Colorado Springs serves Colorado Springs, Monument, Palmer Lake, Black Forest, Manitou Springs, Security and Widefield. Cazares and Crocker are both retired veterans, having served more than 20 years in the Air Force. Following their military service, Cazares worked as an engineer and project manager for one company through five mergers until that company downsized by 20 percent in 2015. Crocker served in the reserves and worked as a draftsman/surveyor before becoming a stay-at-home mom. Once their kids were out of school, she worked in database management and as a paralegal. They opened House Doctors in mid-2016. Cazares is expanding his team to serve more customers and continue his outstanding service for his repeat customers and referrals. Cazares is on track to beat his 2017 projected sales goals. “We started this business because we saw there was a real need to help busy families, single parents, veterans and seniors in our community to properly maintain their homes and protect one of their most important investments. We are working heavily with those people as well as with property managers – we’re building relationship and, in turn, growing the business. We’re looking forward to doing more of that in 2018 and beyond,“ Cazares said. House Doctors’ background checked and uniformed handymen technicians specialize in projects that take two hours to two days to complete, such as light remodeling and repairs of decks, doors, bathrooms and kitchens; repairing drywall; painting; exterior repairs; making home modifications and much more. House Doctors of Colorado Springs and their technicians are bonded and insured. Cazares and Crocker have lived in the Colorado Springs area for 25 years and raised their family in the Colorado Springs community, and now their grandchildren are being raised there. The two continue to be active volunteers and members of Antioch Church in Colorado Springs. To learn more about House Doctors of Colorado Springs and to schedule services for your home, call (719)596-1111, email HD540@HouseDoctors.com or visit http://www.HouseDoctors.com/handyman-coloradosprings.